There are many wonderful options for birders in and near western Montana – Yellowstone, obviously, and Glacier National Park, and Freezeout Lake and Lee Metcalf and on and on. But what if you’re not a birder? What if you are a parent with a young child, or a student with a dog and a long winter break ahead, or a retiree with a fresh batch of free time on your hands, and you’d make a wonderful birder… but you don’t know it yet? Then, my friend, Missoula would like to offer you Greenough park. Though it embraces only forty-two acres, Greenough is big enough to spark a non-birder’s interest in the avian world. It is nestled along the banks of scenic Rattlesnake Creek. It is accessible by car, connected to the city’s system of bike trails and easily walkable from nearby residential neighborhoods. There are picnic tables and public restrooms and other accouterments of civilization around the perimeter, but the heart of the park is the Bolle Birdwatching Trail. The trail is named for Arnold Bolle, a member of the University of Montana’s forestry department who was an early advocate of incorporating a conservation ethic into forest and range management. More importantly for our purposes, he was also an avid birder whose legacy included a thorough bird census of his neighborhood park, Greenough. About a mile in length, the trail is paved for bicyclists and those who aren’t steady on their feet, but also offers several unpaved offshoots for the more adventurous. It runs up and down the lower Rattlesnake, through cottonwoods and firs, past mountain ash and elderberry. 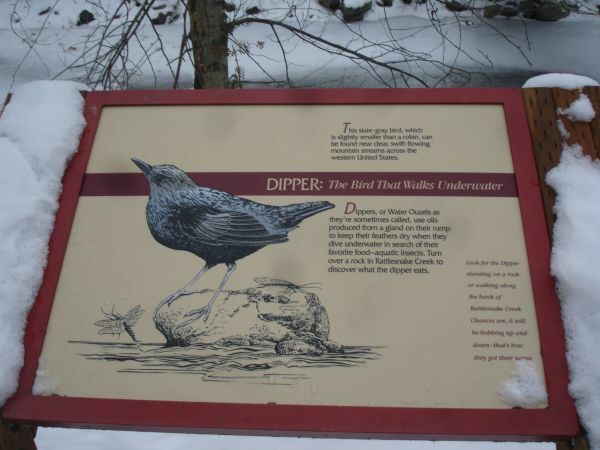 Attractive interpretive signs pick out a handful – American Dipper, Bohemian Waxwing, American Kestrel, Belted Kingfisher and more – which the novice birder is particularly likely to see. But if you don’t see them, don’t worry; the signs also tell you how to identify the traces they’ve left on the landscape, like the mountain ash distributed by the Waxwings and the holes carved out by the resident but elusive Pileated Woodpeckers. I don’t know what process they used to place these signs – mountain ash is supposed to be good for dowsing, so maybe that was involved – but on my first visit to the park an American Dipper was foraging directly behind the Dipper sign (no four step process necessary) and a Belted Kingfisher flew over the Kingfisher sign. Magic aside, a lot of thought clearly went into this trail. Similar care is used on the park itself – invasive Norway maple has been cleared to make room for native plants, and a project is currently underway to manage erosion while still allowing the Rattlesnake some natural freedom to flood and meander in the spring like a creek should. And this effort has been rewarded with sightings of more than 100 species of bird in the park. Besides the above-mentioned, Bullock’s Oriole, Lazuli Bunting, Western Screech-owl, and Black-headed and Pine Grosbeaks may all be seen here in their various seasons. White-tailed deer and black bear also use the park, which links up with a series of other green-space areas to provide a bit of a wildlife corridor through the Garden City. In short, this little and little-known park seems to me to be a big example of doing it right. In a time when there is much discussion about how to get a younger and more diverse crowd interested in birding, when it is critical to keep citizens and voters engaged with the natural world so that they’ll value it in their decision-making, a lot of birders could do worse than to thoroughly survey their local parks, discover how they are governed, and get involved in advocating for green space that will both serve and educate the non-birding public. Greenough may not have spectacular scenery or host rarities that would make Roger Tory Peterson rise from the grave, but that’s not the only kind of park we need. I once saw a huge flock of Bohemian Waxwings near Greenough Park. Sounds like they still frequent the area? Nicely said. My main birding grounds is a park of about the same size (maybe a tad bigger) in the middle of my urban Minneapolis neighborhood. It’s not a birding hotspot by any means, but it’s somewhere I can walk to nearly every day. I often wish there were something a little more ‘natural’ nearby, but it at least allows a large number of people to enjoy a bit of nature, and my “Park List” is at a respectable 106 species over the last 2 years. Sounds like a wonderful place to take children! Thanks for telling us about it. Mary – I haven’t been fortunate enough to see any myself but the anecdotal evidence seems to indicate that they’re still around. Is Greenough really pronounced “Greenuff”?